August - is always a very active month in our calendar and this year was no exception. We did miss going to Edinburgh Fringe but there were other compensations and although the weather proved to be damper than the average we still had a great month. Apart from the life events we also welcomed Dave & Lucie into our home for their final month in this country before flying off at the beginning of October to work in Australia for up to four years. We've shared with them the trauma of selling up their house and all their worldly goods leaving them with sufficient clothes to start a new life in Oz. 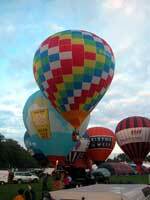 Dave will be flying commercial balloons in the Hunter Valley, north of Sidney, and Lucie hopes to continue nursing. 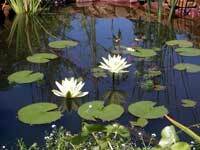 The pond has settled down during the summer and the lily given to us by Dave & Lucie has started to flower. It is unusual because the flower is above the water rather than resting on it and the reflection on the pond adds a special dimension. Ever since we completed the pond we've been trying to get a trickling sound from the rill and the initial rushing water nearly drained the pond but we've managed to build a pebble weir that makes a very subtle water tinkling noise. The number of frogs inhabiting the pond seems to be growing so we looked forward to some serious frog spawn next spring. The Bulrush is growing very well and there should be seed heads on it next year provided it survives the winter months. 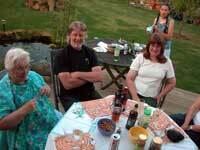 Jane's mum came to stay one weekend and the Saturday evening weather was good enough for a barbecue. Initially this was going to be a family affair but in her usual style Jane opened this up to all and sundry so we finished up catering for ten. Steve is not renown for his cooking and a barbecue is just too Neanderthal for him so he managed to burn the sausages, over cook the lamb strips and flame the bacon to nothing, at least nobody was going to die from eating undercooked meat. Jane put together some excellent salad and nibbles so if the meat wasn't good, at least the company was. After a few drinks and silly conversations the whole world looked in good shape and we talked and drank late into the night. Film of the month was I, Robot. Steve has been a fan of Asimov for most of his adult life and at one time knew the 3 laws of robotics off by heart. It was with some trepidation he went to see what Hollywood would do to a subject he loved so dearly. As it turned out the story line was close to Asimov's general themes and Will Smith's acting was excellent. Steve's sure there is a fourth law of robotics that Asimov introduced in one of his later books but he cannot remember what it is or why it was introduced - possibly a job for Google. If anyone has any ideas please let us know. 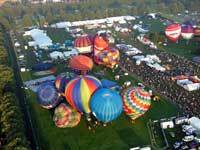 The main event in August this year was the Northampton Balloon Festival. For the first time we entered our own balloon G-CZAG and Steve was not flying a passenger balloon. The forecast the day before was very pessimistic for flying, with Friday looking very wet and windy, and the rest of the weekend dominated by a low. As it turned out we managed to fly three slots out of six which was better than expected. The Saturday morning flight was quite fast with Nick undertaking the take-off and Steve managing the landing - there was considerable wind sheer and Steve was pleased to make a reasonably controlled landing in difficult circumstances. For the evening flight Steve flew a couple of people from his work and then Nick flew on the Sunday morning. As always the flights had their moments, if not for the pilot then the crew had some challenges. The heavy downpour on Friday evening meant that the fields were quite soft and muddy so on one occasion we had to lift the basket and envelope to the edge of the field at the farmers request. It's unusual to be able to get a photo of our balloon from the air this shot shows our balloon still in the arena (furthest balloon on the right in the closest arena) but someone flying in Dave's balloon was kind enough to give us a CD of their festival pictures and this was one of them. The closeness of the balloons when they're inflating means that it can be quite hazardous during take-off. There is the risk that someone could fly through the top of your balloon and rip the material before launch or you climb too quickly and collide with a balloon above. You need eyes everywhere and the safest bet is to get away first to avoid the crowd. Some very confident pilots love to be in the middle of events but not Steve, he prefers to clear the field and then look back as each balloon pops up out of the arena like a bubble rising in a bottle. This year there were some special shapes that we hadn't seen before. There was a frog from Holland, UFO from America, Panasonic battery, Churchill Insurance bulldog, Scottish piper, a beaver (subject to a lot of innuendo), Jaguar car and the Chubb fire extinguisher. Many of these shapes are so special that they are laid out on groundsheets to protect them from the damp grass however there isn't time to for the crew to arrive at the landing site, get the permission of the landowner and spread out a groundsheet so it all seems a little pointless in the first place. As companies cut back on their advertising budgets so the number of advertising special shapes has reduced. The Foot and Mouth epidemic also meant a whole year without flying so businesses found themselves contracted to pay pilots, crew and insurance when there was no flying allowed. We finished the month with some delicate gardening touches and one or two chain saw massacres. 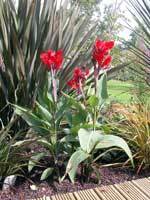 We bought a Canna architectural plant (see photo) for our grasses area next to the pond the only drawback is that because it's from South America we will need to protect from frosts, possibly digging it up and putting it into the greenhouse to over winter. Next door had a couple of large trees that were blocking light out from the summer room and shading the decking area so, having gained permission to remove them, Steve took the chain saw for a work out. This was a physical work out for Steve with Dave lending a hand. It also gave the opportunity for a bonfire in the field behind the garden but it may take several attempts to get rid of it all.